Up to 6 tickets per person are free. Amount shown on ticket page will be zero balance at checkout, after you login or create profile. Seating is General Admission and seats are aassigned on a first come/first served basis at each performance. Playhouse Members and Subscribers can get reserved seating. 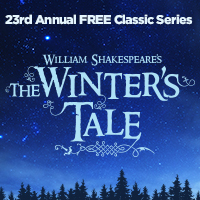 During the run of The Winter's Tale, please help us meet our annual budget target, by becoming a member or donating what you can, during your ticketing process. Membership starts at $50.